If you call our Florida collection attorney, he will discuss how our Florida collection law firm will help your company become proactive in reducing your company’s account receivable. Communication with your customer regarding open invoices is the first step. Make sure you put payment terms o n your invoices and as soon as a payment becomes more than seven to ten days late, a courtesy call and follow-up written communication should be sent. Florida collection attorney Stephen Gebeloff explains that it is important to keep accurate notes of all conversations. If early warning flags regarding non-payment are raised, it is time to consider sending the account to a third party to assist with the collection of the account. Our Florida collection attorney, when a past due account is placed with our debt collection law firm, begins to devise a strategy to assist your company collect the account. The Florida Department of State is searched to first determine if your customer has properly maintained its corporate charter. 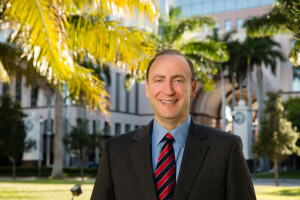 Florida collection attorney Stephen Gebeloff many times finds the officers of your customer have already began to move assets into a new company. If that is the case, a lawsuit is recommended which will include counts for fraudulent transfer and successor liability which will also name the officers as defendants in their individual capacity. 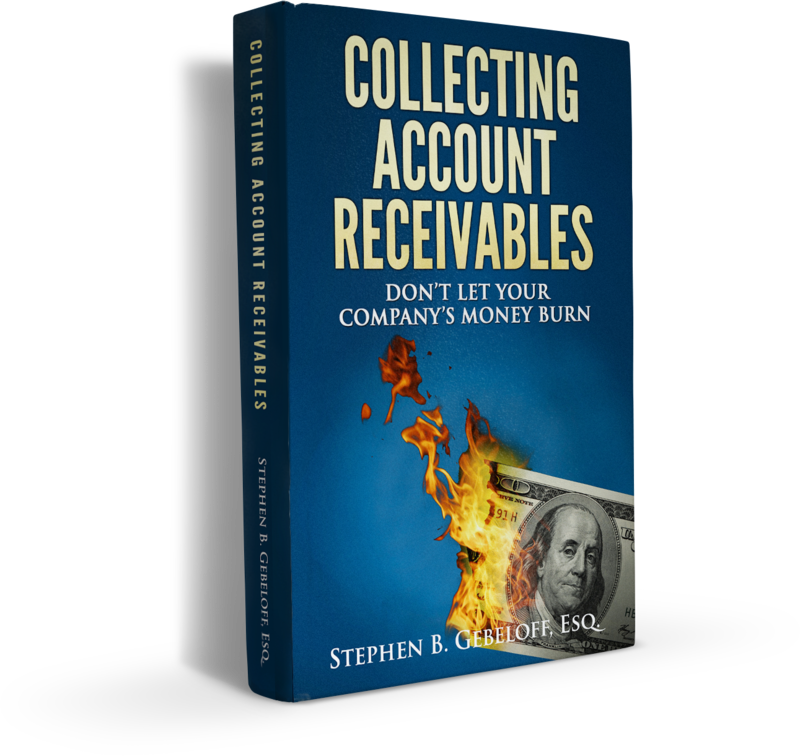 Here is a link to our law firm’s e-book – Collecting Account Receivable – Don’t Let Your Company’s Money Burn. 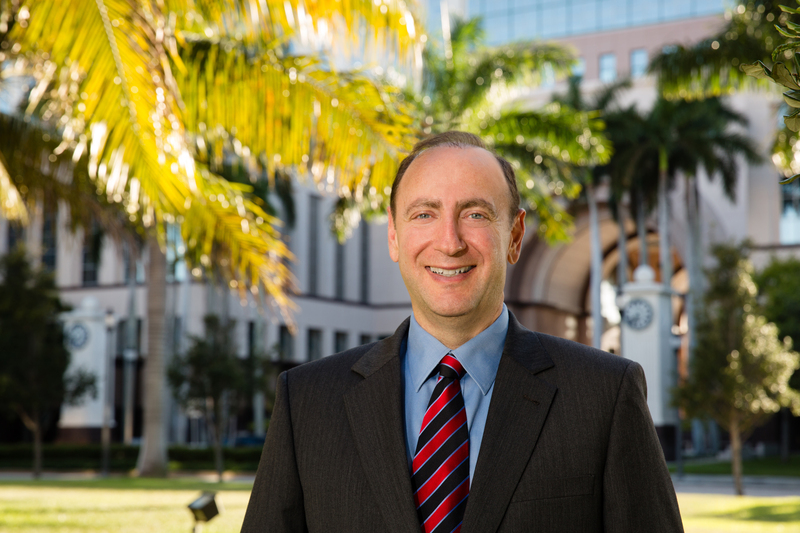 After you read the book, please call and speak to Florida collection attorney Stephen Gebeloff to answer any other questions on Florida debt collection law. Our clients call our Florida debt collection law firm asking to speak to our collection lawyer. They frequently ask the collection attorney how to collect money owed in Florida. If you are looking for a Florida collection attorney to assist your company collect past due account receivable, our Florida debt recovery law firm would be happy to answer your questions. 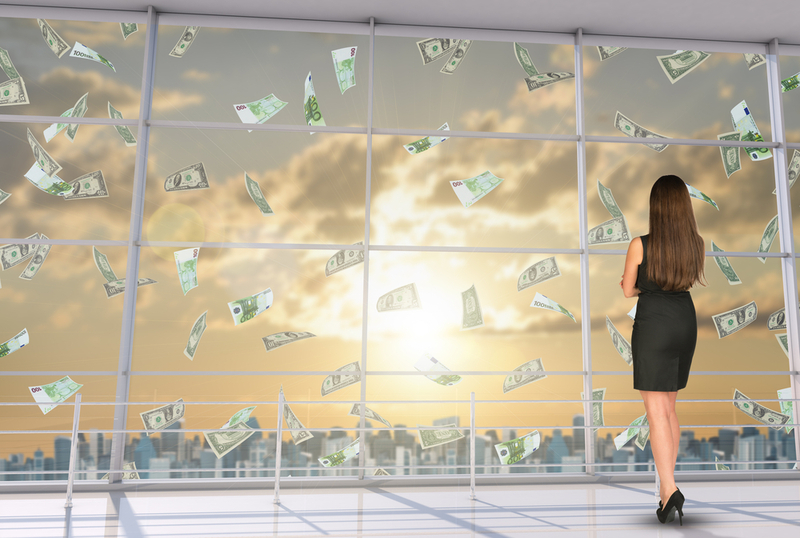 Florida Law has several nuances when it pertains to collecting money. Our website has many articles on Florida debt collection to assist our clients and help advise our debt recovery clients on how to collect their money. A very common topic that our Florida debt recovery clients asks is how do I collect a Florida Judgment. Post judgment collection in Florida has several different options for our debt collection law firm clients to consider. Our law firm’s collection attorney will explore several different options that may be available to assist locate assets that can be seized to satisfy in whole or in part a Florida Judgment. Every debt collection case in Florida has its own unique set of facts. What may prove a successful debt collection strategy in one case, may not prove to be a successful debt recovery strategy in Florida in another collection case. Florida collection attorney will be attending the South Palm Beach County Bar Association 57th Annual Installation Gala at the Woodfield Country Club in Boca Raton Florida. Our debt collection law firm has been providing debt collection legal services to clients in Florida since 2004. Our collection lawyer has thirty years of legal experience and he prides himself in offering companies seeking alternative ways of attempting to collect past due debt. The South Palm Beach County, Florida Bar Association has some of the top lawyers in the county as members. Our collection attorney is often asked for his advice from these Florida lawyers on how to help collect on some their law firm’s debt collection matters. Obtaining a judgment in Florida is only the first step when trying to recover past due accounts. Our collection lawyer will explain to our law firm’s clients that there are several ways to uncover assets and collect on past due accounts. The collection attorney has been using charging liens to attach the interest of officers, directors and members of Florida entities. There are other post judgment methods that will be presented by our Florida collection attorney and will explained to our Florid debt recovery law firm’s clients. When you call our law firm in Florida that collects past due debt, our collection attorney will learn more about your company’s account receivable practice and procedure with the goal of helping your company reduce the amount of bad debt it has on the company books. Our collection lawyer will take the time to help shape your company’s internal debt collection policies and procedures. We are happy to assist all our Florida clients with their debt recovery and credit and collection needs. When your company is looking to collect past due accounts, it can consider using a Florida debt collection agency or a Florida debt collection law firm. A collection agency in Florida is only able to send collection letters and make debt collection calls. Using a Florida collection attorney puts the additional power of using a law firm that will be able to start suit to attempt to collect the past due account receivable. The Florida collection lawyer would file a debt collection lawsuit and then prepare a summons to serve the debtor. Once a debtor receives a debt collection lawsuit prepared by a Florida debt collection law firm and signed by a collection lawyer, your customer knows that they will need to address the past due account. When you call our Florida collection law firm, ask to speak to our collection attorney. Together we will review your company’s credit and collection policy and procedure. The first step is to recognize that being proactive in your company’s internal collection efforts can reduce the number of delinquent invoices. The Florida collection lawyer will explain, despite your company’s best efforts on collecting on past due invoices, there will always be accounts that should be turned over to a Florida debt collection law firm. Our collection attorney will explain our debt recovery firm’s procedures, so your company is comfortable working with our collection lawyers. Our Florida debt collection law firm helps other attorneys throughout the State of Florida collect the Judgments they have obtained for their clients. Our Florida collection attorney has lectured throughout Florida helping other attorneys understand how to use advance debt collection tools available once a judgment is obtained. Our collection attorney looks at different ways to impose personal liability on officers of companies when the company has not paid for goods or services your company has provided. Call our debt collection law firm and ask to speak to our Florida debt collection attorney to discuss your company’s various debt collection options. Our Florida collection attorney receives several e-mails and phone calls a week from potential clients who are looking for a law firm in Florida that can help them collect money. Sometimes the nature of the debt collection matter is money loaned pursuant to a promissory note, money owed for goods or services provided or many people call our debt collection law firm for advice on how to collect on a Florida judgment. Our Florida collection lawyer recognizes that no two debt recovery matters are exactly the same and looks for different solutions for each of the law firm’s clients who call seeking help with collecting their money. Collecting money is not easy is Florida. Florida is a very debtor friendly state that offers debtors many exemptions from levy and garnishment. It is important that you speak to a lawyer in a Florida debt collection law firm to explore your options when attempting to collect money from your customer. Our Florida collection attorney will be able to discuss how our Florida debt collection law firm can implement several different debt collection strategies that may be able to impose personal liability on the officers and directors of companies if there is fraudulent activity. Our collection attorney will speak to you about helping your company establish a more effective credit and collection strategy. 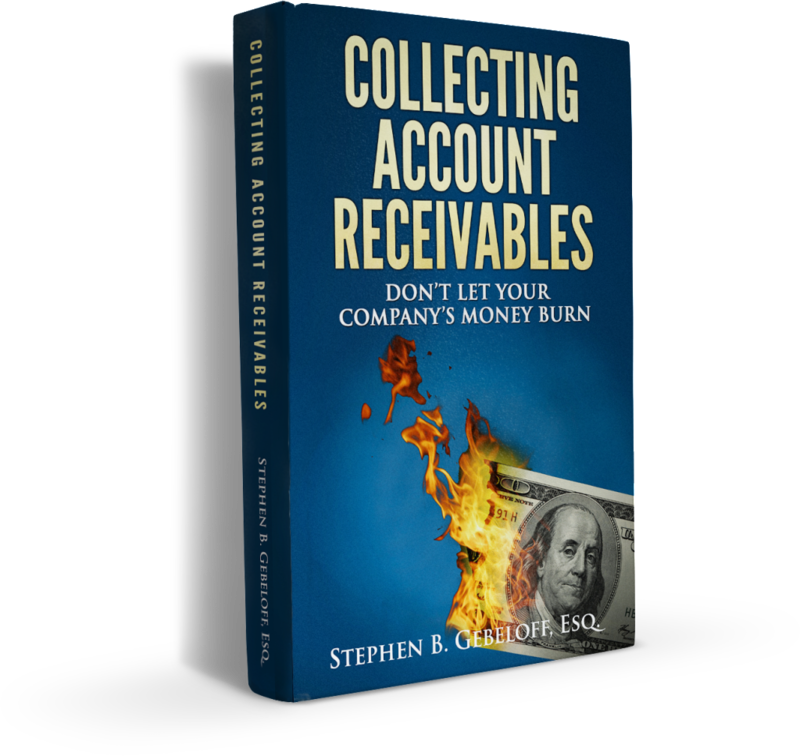 It is important for your company to stay on top of its account receivable early on. Our collection attorney will speak to you about your company’s internal debt collection procedures to help your company collect more of its money. Feel free to discuss with our Florida collection attorney how our debt collection law firm can help your company be more successful in collecting outstanding invoices. When your customer owes your company money for goods sold or services your company provided, it can place huge strain on your company’s cash flow. 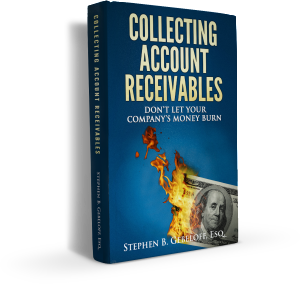 Our debt collection lawyer has authored a free e-book on collecting past due accounts. Our debt collection lawyer has helped many companies improve their cash flow by implementing a better internal debt collection strategy. If you call our debt collection law firm, our collection attorney would be happy to discuss a debt recovery strategy that is tailored to your company’s debt collection needs. When deciding to use a debt collection agency or debt collection law firm there are several factors to consider when trying to recover your company’s money. Collection agencies are not licensed to practice law. A collection agency if they are unable to collect the past due account, must then forward the claim to a debt collection law firm for a collection lawyer to proceed. A collection agency would then have to charge your company a higher contingent fee once they place the collection matter with a debt collection law firm. Collection lawyers are licensed to practice debt collection law. Collection attorneys can write debt collection letters on their legal stationary. Receiving a collection letter from a debt collection law firm has a bigger psychological impact on the debtor than receiving a collection letter from a commercial collection agency. When your customer receives a legal letter demanding payment for past due debt, they know that your company is serious in pursuing collection of the past due account. Our debt collection law firm can customize the debt recovery letter to maximize the effectiveness of the letter which will demand payment for the past due invoices. Your customer will know that our collection lawyer is ready to litigation, if necessary to help your company recovery money that is due.